While research has investigated risk-taking in play for children from the age of four years upwards, less is known of risky play with children under four years. A small-scale observational study with children from five childcare settings with differing characteristics was undertaken to explore the occurrence and characteristics of risky play for children under four years of age, in relation to the current understanding of risky play. The study found similarities across the different contexts, which seem to reflect the characteristics of risky play for children aged one to three years. The findings suggest that the existing definition and characteristics of risky play are appropriate for two- and three-year-old children, but for one-year-olds, the study found discrepancies indicating deviations from existing definitions, indicating that the concept may not be so useful for this age group. To develop understanding of risky play, this article suggests new categories and an adapted definition. All the early childhood teacher students at QMUC experiences a winter week as an important part of their education. During that week they learn about how to be in the outdoors and to engage in play and activities with children – in environments covered with snow and ice. They learn to build landscapes for play and activity on snow – with and without skis or sliding equipment, they learn how to make art out of snow and ice, they learn how to find traces of animals in the winter landscape and about plants and nature’s processes during wintertime. And much more…. Check out this video that the students made today – from todays experience at out outdoor “classroom”, Frøset Farm. “Injuries in Norwegian Early Childhood and Care (ECEC) Institutions” published in NORDIC EARLY CHILDHOOD EDUCATION RESEARCH JOURNAL. Anyway. I would like to present two PhD students. They both have very interesting projects and I am trying to be a supervisor for them. His third article is soon to be submitted to a journal. Good luck to both Kathrine and Rasmus! Risky play? Adventurous play? Challenging play? The last weeks (and months?) there has been a debate about terminology when we talk about risky play and children’s risk-taking. I would like to share my view on this issue. First of all, I would not criticize anyone who use other terms than I have chosen to use when I write about my research, talk to parents or ECEC practitioners, politicians or other stake holders. My aim is to explain why I am not afraid of using the “risk-word” and why I think it is the most appropriate to use – in my context. Recent blogs have suggested that we stop using risk and instead talk about adventure/adventurous play or challenge/challenging play. I think these are interesting reads, but I can’t say I agree with everything. I am a Norwegian, and even though I know I also communicate with an international audience, I spend most of my days in a Norwegian context talking to Norwegian early childhood teacher students, Norwegian ECEC practitioners, Norwegian parents and grandparents, Norwegian politicians and Norwegian researchers. I think maybe the (seemingly) disagreement about terminology might be a result of different cultures and languages. In Norway we have no problem using the concept risky play (in Norwegian “risikofylt lek”) in our common language. It is even mentioned in some of the policy documents about Norwegian child care, and it is a concept used by both the Ministry of Education, politicians, public health professionals, injury prevention professionals, teachers, insurance workers, parents, grandparents, etc. etc. And, it is not used as something completely negative – it has both a positive and a (possible) negative side. In the Norwegian daily vocabulary synonyms for risk(y) are both words such as danger, loss and threat, but also words such as responsibility, take a chance, to dare something, courage, opportunity, change etc. So instead risky is the concept that makes people, at least in Norway, understand what we are really meaning when we talk about it. Risky play and risk-taking have both positive and negative associations, and I don’t think we should cover what we mean with softer words to make it JUST positive (and more acceptable for some groups). For me it’s actually an important point that the meaning of the term ALSO includes the possibility of a negative outcome – since the fear of this outcome is the reason we have all the restrictions and surplus safety in the first place. Our very clear message should be that children’s risky play (yes, risk (!) but in a playful and relatively safe context) most often leads to positive outcomes; exciting experiences, development, learning, mastery….etc. I am comfortable with using risky play (a noun), risk-taking in play (a verb), children taking risks etc. But I still stick to the word risk. I would say that people in any culture might want to use the word best suited for them to communicate what they want to communicate as long as they are conscious about what they gain or miss by using what they are using. I don’t think that would be good for our “case” in the long run, unfortunately. I have published a new article together with my colleague Ole Johan Sando. 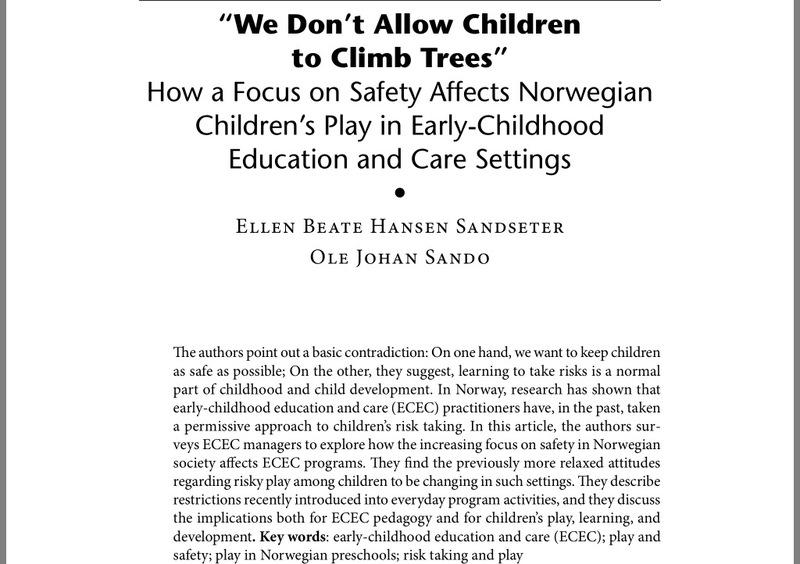 It draws a rather negative picture of the development towards a more safety focused an restrictive perception of children’s play in Norwegian early childhood education and care institutions. This is what we are fighting against here in Norway. At the moment it is just a tendency, but we don’t want it to dominate the provision of play in our country!! Together with my colleague Monica Seland I have just published an article from the Children’s well-being and participation project. This article focuses on how their exeriences of activities and opportunity for participation in the ECEC daily life are related to their subjective well-being. During the fall I have been involved as a consultant on this very interesting report. For all of you who reads Norwegian, and are interested in how to make good transitions for children between ECEC and school I recommend downloading the report! It is a part of the Canadian Report Card of this year! It is all open access, so enjoy reading! This has been such an interesting collaboration for a foreigner like me in a Canadian context, – thanks to all my collaborators! Write your email address to follow this blog.